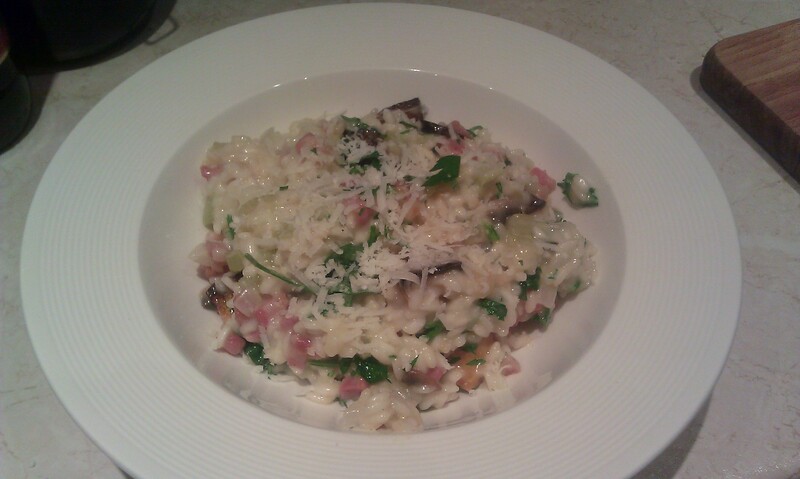 I’m a sucker for risotto, it’s one of my favourite things to eat and to cook. I’d never tried it until I was living in Italy, in a lovely town called Forlì, when a friend came round and cooked me a risotto with pancetta, prawns and mushrooms in, if I remember correctly. My dad has always said he doesn’t like risotto (hence not eating it as a child), and my boyfriend said the same until I made him try it – now it’s one of his favourite dishes. Chop the butternut squash into small bitesize chunks (you can leave the skin on or take it off, it’s up to you), and put it into a roasting tray. Add 3-4 unpeeled cloves of garlic, some salt and pepper and plenty of olive oil. Toss it all around so the pieces of squash are all coated in oil, then put in the hot oven for around 45 minutes, or until the squash is tender and starting to brown on the edges. Turn the squash once or twice during cooking. While the squash is cooking, heat some olive oil and a knob of butter in a large saucepan, then add the onion, celery and two cloves of finely chopped or crushed garlic. Let this cook very slowly on a low heat for about 15 minutes, until all the veg have gone soft and translucent – this is a soffrito, and is the starting point for a lot of Italian dishes. Add the rice and turn up the heat – keep stirring, and it will start to go translucent after about a minute, at which point add the sherry or wine. Stir it into the rice, and keep going until it has all been absorbed. Now it’s time for your first ladleful of stock, along with a pinch of salt. Turn the heat down, and stir the liquid into the rice, really massaging it in with the spoon – you’re trying to get the starch out of the rice to thicken the sauce. Once the liquid has been absorbed, add another ladleful and repeat. Before you finish your stock, you need to fry your pancetta (and sausages, skins removed), so put it in a frying pan on a moderately high heat – you don’t need any oil. Let it fry until the pancetta is starting to turn golden and crispy, and then add the sliced mushrooms for the last minute or so. 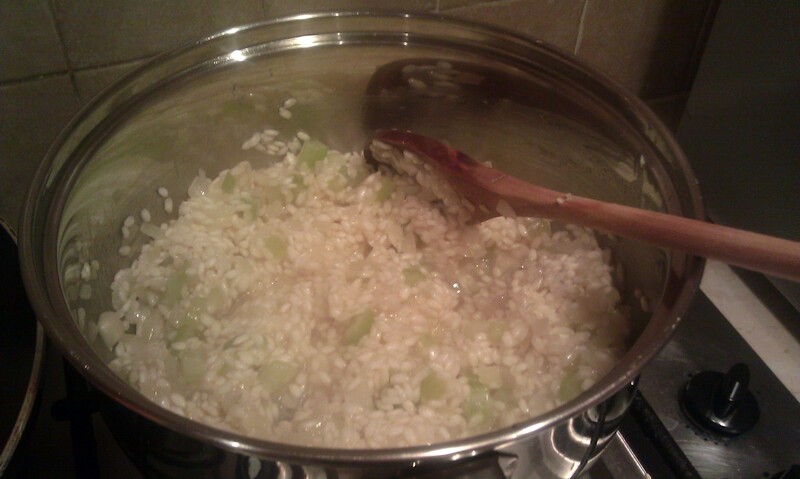 Back to the risotto – once you have finished getting through your stock, taste the rice – it should be soft with a slight bite. Turn the heat off. Put the knob of butter in, as well as the vast majority of the pile of parmesan and stir, then put the lid on and leave it for two minutes. When your two minutes are up, remove the lid – your risotto should be thick and creamy and fabulous. 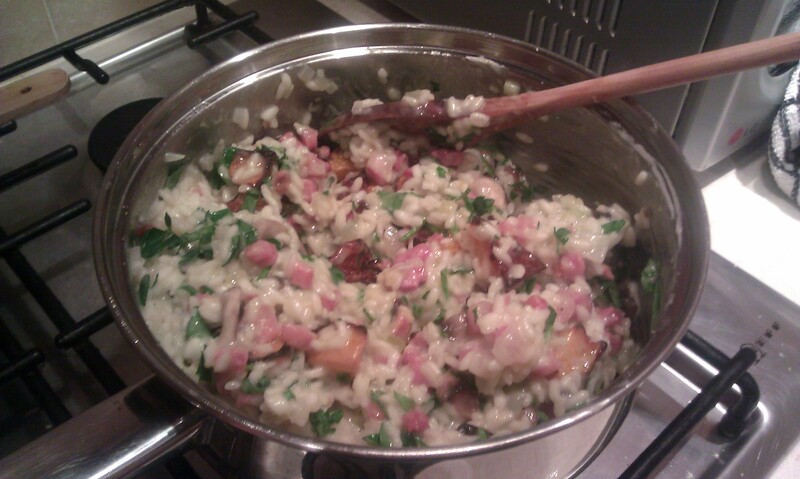 Add the pieces of squash, the pancetta, sausages and mushrooms and the chopped parsley and give it all a good stir. Serve in soup bowls, and garnish with a bit of parmesan and parsley. My boyfriend (often referred to as Mr F) likes to put black truffle oil on his as well, but I find it a bit overpowering. Let me know how you get on, and buon appetito!